Nos 55 and 57 have at various times been separate shops and combined as a single unit as is the case today. Septimus Champ - Stationer and confectioner (K1916). 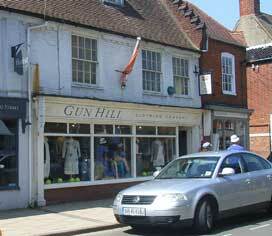 The shop also occupies No 57.next door. Later, during the 1930s and 1940s, Septimus will be running a general store at No 46 Victoria Street. 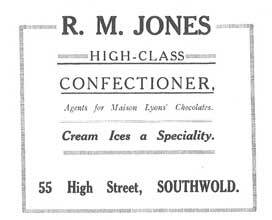 Mrs R M Jones - Confectioner (SSW1922). 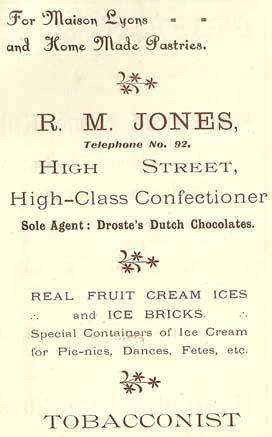 By the end of this decade, the Jones business will have moved across the road to No 54 where it will be managed by Mrs Jones daughter C M Jones until her marriage to Sydney Denny and the integration of the Jones' confectionery business into the Denny emporium at No 2 Market Place, making it 'Denny & Jones'. Reginald Pepper - Fruiterer and Greengrocer. Reginald Pepper - Fruiterer and Greengrocer. Between these dates, Mr Pepper is recorded as running both 55 and 57 . 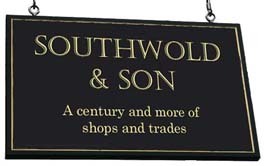 It may be that the shops have been combined since 1933. Mrs E Bird - Fruiterer and Greengrocer. Mrs Bird is the sister of Miss Muriel Hurr who trades next door at No 53.and owns Nos 53, 55 and 57. Derek and Mary Smith - Fruiterer & Greengrocer. This year they purchase the premises at Nos 55 and 57 from Miss Muriel Hurr who trades at No 53, and the existing greengrocery business from Mrs E. Bird. At about this time. Mary Smith takes over No 59, next door, to start a florist's business, 'Emmeline's', named after her and Derek's daughter.